Craig Anthony Robert Mackail-Smith (born 25 February 1984) is a professional footballer who plays as a striker for Notts County of League Two, on loan from League One club Wycombe Wanderers. He was capped by the England national C team and the Scotland national team. Born in Watford, Hertfordshire, Mackail-Smith began his career with the youth system at St Albans City in 1999. He made the step up to the first-team during the 2000–01 season, making his debut as a 68th-minute substitute in a 0–0 draw at home to Billericay Town on 10 March 2001. Mackail-Smith made his first starting appearance for the club in a 1–1 draw away to Gravesend & Northfleet in the Full Members Cup third round, resulting in a 4–3 defeat on penalties after a penalty shoot-out. He made six further starting appearances to complete the season with a total of ten appearances in all competitions. Mackail-Smith struggled to hold down a first-team place during the 2001–02 season, making just 13 appearances, of which only three were from the starting lineup. However, he scored his first senior goal in a 2–0 win away to Hertford Town in the Herts Senior Cup second round on 20 November 2001. In 2002–03, Mackail-Smith continued to find his first-team opportunities limited, making just five starting appearances from 22 matches in all competitions. He scored once in a 3–2 win away to Hampton & Richmond Borough on 26 April 2003. Mackail-Smith was loaned out to Isthmian League Division One North club Arlesey Town in 2002–03, before making a permanent move for the 2003–04 season. He made 54 appearances, scoring 17 goals during the season, including a brace in a 4–2 win at home to Dagenham & Redbridge in the FA Trophy on 3 February 2004. In May 2004, Mackail-Smith joined Conference National club Dagenham & Redbridge, where he scored 38 league goals in two-and-a-half seasons. On 29 January 2007, Mackail-Smith was signed by League Two club Peterborough United, with Dagenham retaining 15% of any future transfer fee. He made a strong start to his Peterborough United career, scoring eight goals in 15 games. Peterborough won promotion to League One in Mackail-Smith's first full season with the club, in which he made 36 appearances, scoring 12 goals. His seven goals in four matches in the FA Cup saw him finish as top scorer in the competition. This included four goals in a 5–0 win away to Staines Town in the second round, which saw him win the FA Cup Player of the Round award. The following season, Mackail-Smith scored 23 goals in 46 appearances to help Peterborough win a second successive promotion to the Championship. Steve Claridge published a scouting report on Mackail-Smith on 23 September 2008. He described him as "a rampaging Nordic Viking with his long blonde hair" and was impressed by the way he would pick up the ball and run at defenders, attacking at every opportunity in what Claridge described as a positive way. Mackail-Smith scored 35 goals for the club in 2010–11, making him the most prolific scorer in England for the season. His 27 goals in League One made him top scorer and earned him the League One Player of the Year award, helping Peterborough to reach the League One play-offs. He was also named in the PFA League One Team of the Year. Mackail-Smith scored in each play-off match, including the second goal in a 3–0 win over Huddersfield Town in the 2011 Football League One play-off Final at Old Trafford to clinch an instant return to the Championship for Peterborough. Following the match, Mackail-Smith expressed his desire to leave the club, stating "I want to play at the highest level I can attain and I want to play in the Premier League." He was the subject of bids from Premier League clubs including Queens Park Rangers. Mackail-Smith made 212 appearances for Peterborough United, scoring 99 goals. 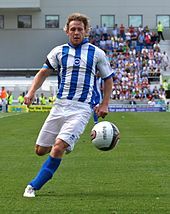 On 4 July 2011, Mackail-Smith joined Brighton & Hove Albion for an initial transfer fee of £2.5 million, possibly rising to £3.25 million, signing a four-year contract. He scored his first goal for Brighton in a 1–0 win away to Portsmouth on 13 August. Mackail-Smith then scored four goals in his next seven matches, including a brace in a 3–3 draw at home to Leeds United. However, Mackail-Smith then hit a goal drought and struggled to score, netting just one goal between October and February in a 1–0 win away to Derby County on 29 November. He ended his goal drought by coming off the bench to score the opening goal in a 2–1 win away to Leeds United, against whom he scored a brace earlier in the season. On his 28th birthday, Mackail-Smith scored at the Amex Stadium for the first time in five months in a 3–0 win at home to Ipswich Town, and scored again the next weekend in a 1–1 draw with Doncaster Rovers. In total, Mackail-Smith scored 10 goals for Brighton, and he revealed his disappointment at his goal haul, which he largely put down to adapting to Brighton's passing style of football. Mackail-Smith enjoyed a strong start to the 2012–13 season, scoring six goals in six games. This included two spectacular strikes, one an overhead kick, in a 3–1 victory over Burnley. He scored a total of 11 goals before a serious injury to his Achilles tendon on 5 March 2013 prevented him from playing for 13 months. Mackail-Smith returned for Brighton's final run-in to the 2013–14 season, playing in both legs of the play-off semi-final against Derby County, which the club lost 6–2 on aggregate. During the 2014–15 season, Mackail-Smith found himself back in the first-team under new manager Sami Hyypiä, but struggled to score, netting just three goals in 34 appearances in all competitions. On 24 April 2015, Brighton confirmed that Mackail-Smith's contract would not be renewed and that he would leave the club during the summer. Mackail-Smith rejoined Peterborough United on loan on 27 November 2014, a move that saw him link-up once more with striker Aaron McLean, having scored 183 goals between them during their previous partnership at the club from 2007 and 2011, which included three promotions. He made his second debut in a 3–0 defeat at home to Bristol City one day later. He was recalled by Brighton caretaker manager Nathan Jones on 23 December, having made three appearances for Peterborough during his loan spell. In July 2015, Mackail-Smith began training with League Two club Luton Town, headed up by his former Dagenham & Redbridge manager John Still. He featured in numerous pre-season friendlies, rebuffing interest from League One teams Blackpool and Southend United, before signing a two-year contract with Luton on 1 August. He debuted on the opening day of 2015–16 in a 1–1 draw away to Accrington Stanley. Mackail-Smith scored his first goal for Luton in a 3–2 defeat away to Yeovil Town on 22 August, and followed up with his second goal one week later in a 2–1 defeat at home to Portsmouth. A fractured tibia suffered after just 15 minutes during a 1–0 win away to Plymouth Argyle on 19 March 2016 ended Mackail-Smith's season, having made 34 appearances, scoring four goals in all competitions. Mackail-Smith suffered a further setback in pre-season ahead of 2016–17 when he underwent surgery to insert a pin in his fractured tibia, ruling him out for another six weeks. However, he made a full recovery and made his return as a 70th-minute substitute for Jordan Cook in a 3–1 win away to Exeter City in the FA Cup on 5 November 2016. Mackail-Smith struggled to force his way into the first-team and returned to League One club Peterborough United on loan until the end of 2016–17. His first appearance after returning on loan came four days later in a 3–0 victory away to Port Vale and completed the loan spell with 18 appearances and five goals. Mackail-Smith was released when his contract expired at the end of 2016–17. On 17 August 2017, Mackail-Smith signed for League Two club Wycombe Wanderers on a one-year contract. He signed a new two-year contract with Wycombe on 26 April 2018. Mackail-Smith joined League Two club Notts County on 30 January 2019 on loan until the end of 2018–19. While with Dagenham & Redbridge, Mackail-Smith received his first international recognition being called up to play for the England C team, winning seven caps and scoring four goals. He helped England C win the 2005–06 European Challenge Trophy, scoring twice. Mackail-Smith qualified to play for Scotland through his Edinburgh-born grandmother Margaret and confirmed his interest in playing for Scotland if called up in May 2009. On 24 March 2011, he received his first senior international call-up from Scotland boss Craig Levein for a friendly with Brazil on 27 March. He made his international debut when he came on as an 87th-minute substitute for Kenny Miller. He scored his first international goal against Liechtenstein on 8 October in a crucial Euro 2012 qualifier, and played in the match against Spain in Alicante on 11 October, winning a penalty from which David Goodwillie scored, in a match that Spain won 3–1. Mackail-Smith played seven times for Scotland in total, scoring one goal. As of match played 26 May 2012. Scotland score listed first, score column indicates score after each Mackail-Smith goal. ^ a b c "Craig Mackail-Smith". Barry Hugman's Footballers. Retrieved 18 December 2016. ^ "Craig Mackail-Smith". ESPN FC. Retrieved 4 August 2018. ^ "Career History". UpThePosh! The Peterborough United Database. Retrieved 17 February 2012. ^ "St Albans City 0–0 Billericay Town". St Albans City F.C. Retrieved 4 August 2018. ^ "Gravesend & N'fleet 1–1 St Albans City (4–3 pen.)". St Albans City F.C. Retrieved 4 August 2018. ^ a b c "Craig Mackail-Smith". St Albans City F.C. Retrieved 4 August 2018. ^ "Hertford Town 0–2 St Albans City". St Albans City F.C. Retrieved 4 August 2018. ^ "Hampton & Richmond Borough 2–3 St Albans City". St Albans City F.C. Retrieved 4 August 2018. ^ "Craig Mackail-Smith Career History". Up the Posh! The Peterborough United Database. Retrieved 18 December 2016. ^ Lakey, Chris (16 March 2011). "Norwich City target Mackail-Smith looking for move". The Pink'un. Norwich. Retrieved 18 December 2016. ^ "Arlesey Town 4–2 Dag & Red". Dagenham & Redbridge Mad. Digital Sports Group. 3 February 2004. Archived from the original on 4 March 2016. ^ a b "Craig Mackail-Smith". Soccerbase. Centurycomm. Retrieved 18 December 2016. ^ "Peterborough recruit Daggers pair". BBC Sport. 29 January 2007. Retrieved 15 March 2016. ^ a b "Games played by Craig Mackail-Smith in 2006/2007". Soccerbase. Centurycomm. Retrieved 18 December 2016. ^ a b "Hereford 0–1 Peterborough". BBC Sport. 19 April 2008. Retrieved 18 December 2016. ^ a b "Games played by Craig Mackail-Smith in 2007/2008". Soccerbase. Centurycomm. Retrieved 18 December 2016. ^ "2007–08 English FA Cup Statistics". ESPN FC. Retrieved 18 December 2016. ^ "Staines 0–5 Peterborough". BBC Sport. 1 December 2007. Retrieved 18 December 2016. ^ "Mackail-Smith scoops FA Cup award". BBC Sport. 10 December 2007. Retrieved 18 December 2016. ^ a b "Games played by Craig Mackail-Smith in 2008/2009". Soccerbase. Centurycomm. Retrieved 18 December 2016. ^ a b "Peterborough win seals promotion". BBC Sport. 25 April 2009. Retrieved 18 December 2016. ^ Claridge, Steve (23 September 2008). "Scouting report: Craig Mackail-Smith". The Guardian. London. Retrieved 18 December 2016. ^ a b "League One 2010/2011 Regular Season". Soccerway. Perform Group. Retrieved 15 March 2016. ^ a b "QPR's Adel Taarabt wins Football League player of year". BBC Sport. 21 March 2011. Retrieved 21 March 2011. ^ "Rochdale 2–2 Peterborough". BBC Sport. 30 April 2011. Retrieved 18 December 2016. ^ a b "Spurs' Gareth Bale wins PFA player of the year award". BBC Sport. 17 April 2011. Retrieved 18 December 2016. ^ a b "Games played by Craig Mackail-Smith in 2010/2011". Soccerbase. Centurycomm. Retrieved 18 December 2016. ^ a b Begley, Emlyn (29 May 2011). "Huddersfield 0–3 Peterborough". BBC Sport. Retrieved 30 May 2011. ^ "Peterborough United accept Craig Mackail-Smith offer". BBC Sport. 1 June 2011. Retrieved 1 June 2011. ^ Swann, Alan (13 June 2011). "Posh accept three bids for Mackail-Smith". Peterborough Telegraph. Retrieved 18 December 2016. ^ "Craig Mackail-Smith heads to Brighton in four-year deal". BBC Sport. 4 July 2011. Retrieved 18 December 2016. ^ Owen, Brian (13 August 2011). "Mackail-Smith hits Albion winner". The Argus. Brighton. Retrieved 18 December 2016. ^ a b c "Games played by Craig Mackail-Smith in 2011/2012". Soccerbase. Centurycomm. Retrieved 18 December 2016. ^ "Derby 0 Brighton 1: Mackail-Smith keeps Seagulls soaring back up". Daily Mail. London. 29 November 2011. Retrieved 29 November 2011. ^ Morgan, Michael (12 February 2012). "Leeds 1 Brighton 2". The Sun. London. Retrieved 18 December 2016. ^ "Brighton 3–0 Ipswich". BBC Sport. 25 February 2012. Retrieved 18 December 2016. ^ Owen, Brian (25 February 2012). "Albion turn on the style". The Argus. Brighton. Retrieved 18 December 2016. ^ "Doncaster 1–1 Brighton". BBC Sport. 3 March 2012. Retrieved 15 March 2016. ^ "Brighton's Craig Mackail-Smith admits goal frustration". BBC Sport. 19 April 2012. Retrieved 19 April 2012. ^ a b "Games played by Craig Mackail-Smith in 2012/2013". Soccerbase. Centurycomm. Retrieved 18 December 2016. ^ "Burnley 1–3 Brighton & Hove Albion". Sky Sports. 1 September 2012. Retrieved 15 March 2016. ^ "Craig Mackail Smith: Injury lay-off tough for Brighton striker". BBC Sport. 7 April 2014. Retrieved 7 April 2014. ^ a b "Games played by Craig Mackail-Smith in 2013/2014". Soccerbase. Centurycomm. Retrieved 18 December 2016. ^ "Derby County 4–1 Brighton & Hove Albion". BBC Sport. 22 May 2014. Retrieved 22 May 2014. ^ a b c "Games played by Craig Mackail-Smith in 2014/2015". Soccerbase. Centurycomm. Retrieved 18 December 2016. ^ "Brighton: Casper Ankergren and Inigo Calderon offered new deals". BBC Sport. 24 April 2015. Retrieved 24 April 2015. ^ "Craig Mackail-Smith: Peterborough United loan return for striker". BBC Sport. 27 November 2014. Retrieved 18 December 2016. ^ Swann, Alan (28 November 2014). "Posh 0, Bristol City 3 – Black Friday for Fergie and his team". Peterborough Telegraph. Retrieved 18 December 2016. ^ "Mackail-Smith returns to Brighton". Peterborough Telegraph. 23 December 2014. Retrieved 18 December 2016. ^ Simmonds, Mike (15 July 2015). "Still happy to play the waiting game with Mackail-Smith". Luton Today. Retrieved 18 December 2016. ^ Watt, William (3 July 2015). "Striker hunt priority with Mackail-Smith in sights". Blackpool Gazette. Retrieved 18 December 2016. ^ Simmonds, Mike (17 July 2015). "Southend declare interest in Mackail-Smith". Luton Today. Retrieved 18 December 2016. ^ "Craig Mackail-Smith: Luton Town sign ex-Brighton striker". BBC Sport. 1 August 2015. Retrieved 2 December 2018. ^ "Match report: Accrington Stanley 1 Luton Town 1 – Jonathan Smith's redemption earns last gasp point". Bedfordshire on Sunday. Bedford. 8 August 2015. Archived from the original on 19 October 2017. ^ "Luton Town throw away two-goal lead in shocking defeat at Yeovil". Bedfordshire on Sunday. Bedford. 22 August 2015. Archived from the original on 19 October 2017. ^ Cunliffe, James (29 August 2015). "Luton Town 1 Portsmouth 2: Match report". Bedfordshire on Sunday. Bedford. Archived from the original on 15 October 2017. ^ a b Simmonds, Mike (1 July 2016). "Doyle ruptures Achilles tendon as Mackail-Smith undergoes surgery". Luton Today. Retrieved 19 February 2017. ^ a b "Games played by Craig Mackail-Smith in 2015/2016". Soccerbase. Centurycomm. Retrieved 18 December 2016. ^ Simmonds, Mike (5 November 2016). "Hylton on the spot twice as Hatters knock out Exeter". Luton Today. Retrieved 18 December 2016. ^ Simmonds, Mike (31 January 2017). "Deadline day: Mackail-Smith leaves Luton for Peterborough". Luton Today. Retrieved 31 January 2017. ^ a b c "Games played by Craig Mackail-Smith in 2016/2017". Soccerbase. Centurycomm. Retrieved 30 April 2017. ^ "Luton Town: Craig King & Dan Potts offered deals, but five depart". BBC Sport. 21 May 2017. Retrieved 27 August 2017. ^ "Craig Mackail-Smith: Wycombe Wanderers sign striker on one-year contract". BBC Sport. 17 August 2017. Retrieved 17 August 2017. ^ "Wycombe Wanderers: Craig Mackail-Smith signs new two-year contract". BBC Sport. 26 April 2018. Retrieved 26 April 2018. ^ "Craig Mackail-Smith: Notts County sign Wycombe striker on loan". BBC Sport. 30 January 2019. Retrieved 30 January 2019. ^ Dunlavy, Chris (18 June 2015). "Steve Morison and Craig Mackail-Smith defend England C". The Non-League Paper. London. Retrieved 18 December 2016. ^ Garin, Erik (3 April 2009). "European Challenge Trophy (U-23) 2005/06". Rec.Sport.Soccer Statistics Foundation. Retrieved 18 December 2016. ^ "Mackail Smith keen to follow Boyd to Scotland". Peterborough Today. 5 May 2009. Retrieved 24 April 2010. ^ "Scotland call up Peterborough striker Craig Mackail-Smith for Brazil game squad". Daily Record. Glasgow. 24 March 2011. Retrieved 18 December 2016. ^ Campbell, Andy (27 March 2011). "Scotland 0–2 Brazil". BBC Sport. Retrieved 1 April 2011. ^ "New Scots star to give debut shirt to his grandma". Daily Mirror. London. 28 March 2011. Retrieved 18 December 2016. ^ a b McGuire, Annie (8 October 2011). "Mackail-Smith goal keeps Scots' Euro 2012 hopes alive". BBC Sport. Retrieved 18 December 2016. ^ McGuire, Annie (11 October 2011). "Spain 3–1 Scotland". BBC Sport. Retrieved 18 December 2016. ^ "Craig Mackail-Smith". Scottish Football Association. Retrieved 18 December 2016. ^ "Craig Mackail-Smith appearances: Season 2000–01 appearances". St Albans City F.C. Retrieved 4 August 2018. ^ "Craig Mackail-Smith appearances: Season 2001–02 appearances". St Albans City F.C. Retrieved 4 August 2018. ^ "Craig Mackail-Smith appearances: Season 2002–03 appearances". St Albans City F.C. Retrieved 4 August 2018. ^ "Craig Mackail-Smith season details 2004/2005". Dagenham & Redbridge Mad. Digital Sports Group. Archived from the original on 12 April 2016. ^ "Craig Mackail-Smith season details 2005/2006". Dagenham & Redbridge Mad. Digital Sports Group. Archived from the original on 4 March 2016. ^ Williams, Mike; Williams, Tony, eds. (2007). Non-League Club Directory 2008. Kingsbridge: Tony Williams Publications. pp. 182–183. ISBN 978-1-869833-57-2. "Dag & Red 4–2 St Albans". BBC Sport. 10 October 2006. Retrieved 18 December 2016. ^ "Games played by Craig Mackail-Smith in 2009/2010". Soccerbase. Centurycomm. Retrieved 18 December 2016. ^ "Games played by Craig Mackail-Smith in 2017/2018". Soccerbase. Centurycomm. Retrieved 29 April 2018. ^ a b "Games played by Craig Mackail-Smith in 2018/2019". Soccerbase. Centurycomm. Retrieved 19 April 2019. ^ a b "Mackail-Smith, Craig". National Football Teams. Benjamin Strack-Zimmerman. Retrieved 18 December 2016. Wikimedia Commons has media related to Craig Mackail-Smith.